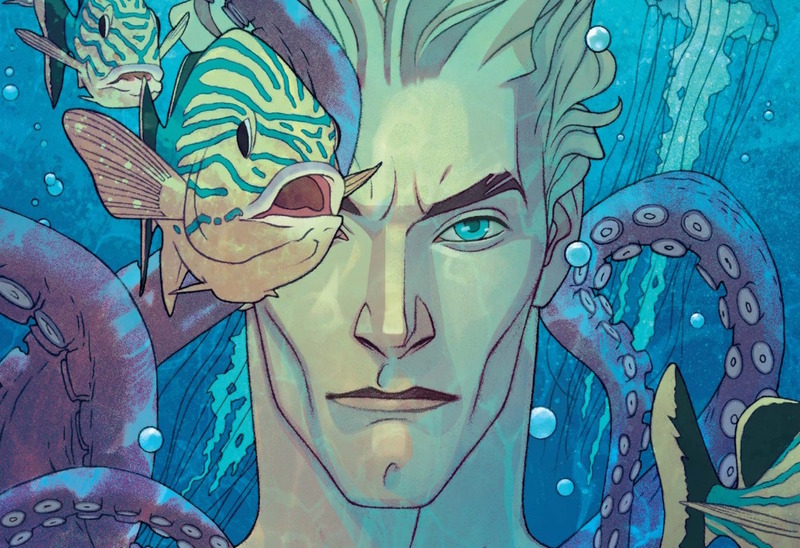 Aquaman #1 Review – AiPT! Aquaman is the king of his people and it’s so easy to forget that important detail. He’s the only hero in the JLA who has to prioritize his heroics and efforts on a group over all else. Batman might protect Gotham, or Superman Metropolis, but it’s only Aquaman who has the actual job of focusing on his people first. That’s an interesting angle DC is shifting focus to in Rebirth, but is it good? Dan Abnett seems to be writing quite a few DC titles of late, and for good reason: he’s proven to be very adept at well paced comic writing with solid character development. On top of that, with Aquaman working to build Atlantis’ image with surface humans, we have ourselves a much more complicated dynamic for him. Black Manta is on his tail too, which makes this story hit close to home as terrorism is involved. Save for the first three pages (more on that later) with Mera and Aquaman discussing the new world he’s trying to develop for his people, this is a well written issue through and through. A new surface human character is introduced who is already setting off sparks with an Atlantean, which also delivers needed exposition and scope one the bigger story going on. Abnett then sneaks a threat right under our noses and blows the story (among other things) right up! It doesn’t stop there either, as we get some primo Aquaman battling too. There’s also a bit of humor (sea slugs ew) and plenty of intrigue. The beauty of this issue is that the real threat isn’t even appearing on the page, but instead we focus on what a terrorist attack might do for the Atlantis image moving forward. The art by Brad Walker is strong with plenty of detail to ogle at. He has seriously done some jaw-droppingly good stuff, with every hair on Aquaman’s head well rendered and some very good work in the embassy where the issue takes place. I get faint hints of Todd McFarlane or Greg Capullo from his work, although Walker’s pen is cleaner than those artists. I’m starting to wonder if Abnett was forced to drag his feet a bit with this series. Back in March Aquaman #50 introduced the embassy, Mera in her own Aquaman type costume (what the hell happened to that?!) and Aquaman’s new philosophy splendidly. Then we were introduced to it again in Aquaman Rebirth, and now again in this issue. Can the story please progress past introductions?! The end of this issue seems to suggest it will, but the rehashing makes the first half of this issue boring if you’ve read those issues. Here’s to hoping we’re done with recapping the embassy and Atlanteans working with humans stuff. When Aquaman does throw down with Black Manta, the art gets a little too abstract in its layouts for its own good. The art itself isn’t too bad, but it’s hard to understand where and what is going in. Each image in its own is detailed and clear, but the scene is a bit hard to follow. Abnett will make you care about Atlantean politics and that’s saying quite a lot when you stop to think about politics in comics actually working. Aquaman feels fresh and more important than ever.